Being the jaded, cynical hacks that we are, it takes something a bit special to provoke excitement at the SOS office, but RME's UK distributor achieved just that when he dropped off a product so new it hadn't even been announced to the world. Yet the Fireface UCX's exciting qualities might not be obvious from a quick inspection. Housed in RME's familiar half-rack case, and bristling with socketry, it looks almost identical to the existing Fireface UC, reviewed in SOS September 2010 (/sos/sep10/articles/rme-fireface-uc.htm) and Fireface 400, reviewed in SOS July 2007 (/sos/jul07/articles/rmefireface400.htm), and boasts exactly the same complement of inputs and outputs. Unlike its siblings, though, the UCX ships with a stylish remote control modelled after RME's Babyface interface/monitor controller. Meanwhile, a quick inspection of the back panel reveals that like the larger Fireface UFX reviewed in SOS January 2011 (/sos/jan11/articles/rme-fireface-ufx.htm), the UCX features both USB2 and Firewire connectivity. It also features newer converters, which are said to offer still better noise and distortion measurements than existing RME interfaces. However, the really exciting features are the ones that are hidden from view. Like all RME interfaces, the UCX works with the company's acclaimed TotalMix control software, which is almost certainly the most comprehensive low-latency monitor mixing and routing utility available with any audio hardware. But the addition of the 'X' to the product name denotes that, unlike the standard Fireface UC, this interface shares the enhanced hardware processing features of the flagship Fireface UFX; so, not only does its TotalMix FX utility give you all of the usual dizzying possibilities when it comes to mixing and routing, but you also get EQ and dynamics on every input channel, plus global reverb and delay as auxiliary effects. What really raised temperatures at the SOS office, though, is the feature I've saved until last. An apparently minor addition to TotalMix is the ability to store up to six complete Fireface UCX setups in the unit's firmware, whence they can be recalled using the front-panel controls in situations where the unit is not hooked up to a computer. This permits the UCX to be used as a stand-alone mixer and format converter, but is also key to an ability that is currently almost unique: the Fireface UCX can operate as a multi-channel audio interface for Apple's iPad tablet computers. There, I told you it was exciting! I'll report back on the iPad functionality presently, but first, a brief overview of how the Fireface UCX functions as a conventional audio interface — brief, because it does most things in ways that are familiar from the Fireface UC and the Fireface UFX, so I'll refer readers to those reviews for more detail. As mentioned above, the UCX can connect via Firewire or USB, and requires separate drivers for each protocol; if you're likely to swap, you'll need to install both. 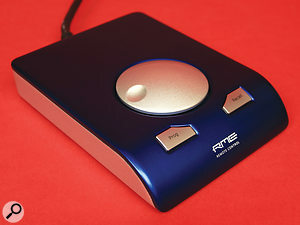 In general, RME's policy seems to be that if they can make it digitally controllable from software, they will, and in fact there are no analogue controls on the unit at all. Everything from preamp gain and phantom-power switching to headphone volume and output levels is controlled digitally, and the single front-panel control is an endless rotary encoder which can be switched to manipulate various important parameters. When the Fireface UCX is connected to a computer, these controls simply mirror actions that could be performed just as well by adjusting controls in RME's TotalMix FX software, but you don't have that option when the UCX is used stand-alone, or as an iPad interface. The latest version of TotalMix FX is so comprehensive that it puts some DAW mixers to shame, and were I to describe it in detail, this review would be twice as long. RME's driver utility (left) and TotalMix FX (right). TotalMix FX is currently displaying, in 'two row' mode, the mix that is being sent to the first pair of analogue outputs. The EQ and dynamics windows are visible on analogue input channels 1 and 2. In essence, its main window provides each output pair with its own independent mixer, in which every input and every return from the DAW has its own channel. (I find the 'two row' option helpful in conceptualising the signal flow here — it displays the inputs and software returns on a single input row, and the outputs on a separate row beneath them.) Each audio input has its own compressor, EQ and aux send for the global delay and reverb, while many other options, including polarity reversal, phantom‑power switching, and even M/S decoding, are available when their channels are expanded. Unlike RME's Babyface, and like the Fireface UFX, the UCX's reverb and delay are generated internally rather than in the host computer, so remain active in stand-alone mode. In conjunction with the company's superb drivers and Digi Check analysis tools, TotalMix FX remains unequalled by any other manufacturer I'm aware of, and forms a powerful reason to choose RME over the competition. Just be aware that the sheer volume of features and options means that it can take a little getting used to! It will surprise no-one to learn that the Fireface UCX performed flawlessly even in my less-than-ideal Windows laptop, nor that it sounds very good indeed. I didn't have access to any earlier RME devices for comparison, so can't say whether the new converters offer an audible improvement, but its audio quality is notably crisp and clear, with precise stereo imaging. The preamps are likewise clean and neutral, and the digital gain controls make it easy to match gain across channels for stereo recording. The headphone amp is also very good. Like the larger UFX, the Fireface UCX can connect either via Firewire or USB2. As a recording interface, there's very little to dislike about the Fireface UCX, and my only real reservation is that, like the UC, its compactness brings disadvantages as well as benefits. It requires an external power supply, the MIDI I/O is on flying leads, and compared with some interfaces in this price bracket, its two mic preamps and single headphone socket make it less of an 'all in one' product. There are already quite a number of USB interfaces and dedicated gadgets that can be hooked up to an iPad via Apple's Camera Connection Kit, which turns an iPad's docking port into a USB connector. However, almost all are restricted to stereo in/out operation. This is because working with iOS (or at least with most apps) requires that an interface operate in class-compliant mode. Not all USB audio interfaces offer a class-compliant mode, and those that do usually only meet the specifications for class compliance under USB1.1, which caters only for stereo in and out. The Fireface UCX is different: it includes an alternative firmware that turns it into a class-compliant USB2 device, which currently permits compatible apps to address up to eight mono inputs and a single stereo output. It's the first device I've encountered that can present eight simultaneous inputs to the iPad, although, in the interests of fairness, I should mention the one other device already on the market that can apparently do so: Tascam's US800. Switching the UCX to class-compliant mode involves a series of front-panel button presses which is short enough to remember easily, but long enough that you're never going to do it by accident! At present, the class-compliant firmware disables the digital inputs: RME say that they have not been able to make the unit sync reliably to an external digital clock with the current iPad operating system (although as this review went to press, they made available updated firmware which activated the digital outputs for the first time: ADAT 1-8 mirror analogue outs 1-8, but with independent level control). The latest version, iOS 5, is required, and the Fireface UCX is compatible with first- and second-generation iPads, but not with iPhones, iPod Touches or anything else beginning with 'i'. 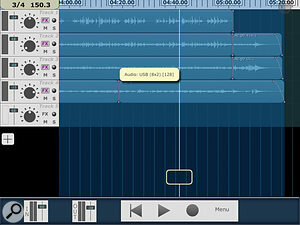 At the time of writing, moreover, there is but one iPad app that supports simultaneous recording of more than two tracks: Harmonic Dog's Multitrack DAW (www.harmonicdog.com), which costs a measly £6.99$9.99. Armed with an iPad, the Camera Connection Kit, a copy of Multitrack DAW and a Fireface UCX, I set out to see whether the iPad really has the potential to be a serious multitrack recording tool. Who Let The Harmonic Dogs Out? 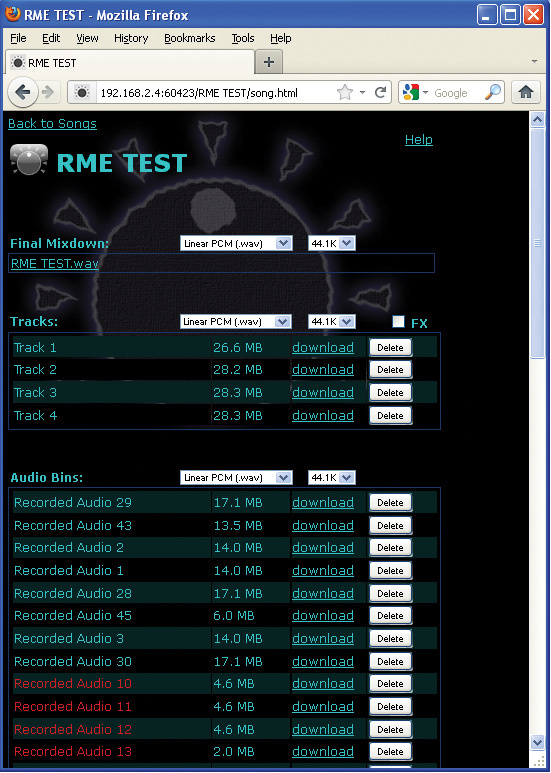 In my case, the first step was to update the UCX's firmware using a downloadable utility from the RME site. This is simple and painless, but only works over USB at present, so you will need to install the USB drivers for it even if you only ever plan to use it over Firewire. Once that's done, all you need do is switch it into class-compliant mode, plug the Camera Connection Kit into the iPad, and connect a USB cable. The iPad recognises the Fireface and, at least in the review system, no further messing about is required. As it's currently the only app that supports the recording of more than two simultaneous sources, I devoted most of my testing time to using the Fireface UCX and iPad with Harmonic Dog's Multitrack DAW. Compared with other iPad apps, it is rather plain from a graphical point of view, but benefits a lot from being coded in assembly language, which means that it is very slick and responsive. I used the basic version, which supports a total of eight tracks, but for the princely sum of £5.49$7.99 you can upgrade to a 24-track version. Harmonic Dog's Multitrack DAW in action. Here, I've just attached the UCX, and iOS is reporting that eight inputs and two outputs are now available. Each track can be mono or stereo. Tracks are added by tapping the + symbol, and tapping on the track header that appears brings up options for arming the track and choosing its input, as well as solo, mute and effects options I'll come to in a minute. Tracks can't be named, though recorded regions can be. With other USB hardware selected, the available input options are limited to Mono 1, Mono 2 and Stereo; but with the UCX attached, you can choose from eight mono inputs or four stereo pairs, corresponding to the UCX's analogue inputs 1-8. You can arm as many tracks simultaneously as you need, whereupon recording is as simple as hitting the large Record and Play buttons at the bottom of the screen. It worked flawlessly the first time I tried it, and it worked every time after that. Multitrack DAW has no MIDI or virtual instrument support, and is never going to challenge mainstream computer DAWs for features, but is nevertheless an effective tool. Each track has a pretty decent compressor, albeit hampered by the lack of any gain make-up or gain-reduction metering, and a less impressive but nonetheless useful two-band parametric EQ with high- and low-pass filters. Faders and pan controls can't be automated but are easy to use, and each track also features a single aux send to a global effect bus featuring simple reverb and delay. All tracks are bussed directly to a stereo master output, which has its own compressor and EQ. A simple menu offers decent help facilities, input switching options and multiple layers of undo, among other features. You can also overdub, punch into existing recordings, and set loop points in the ruler, and there's a simple but effective metronome. Should you wish to monitor inputs through Multitrack DAW rather than directly from the UCX, that's feasible, though arguably a bit pointless, since there are no software instruments or fancy effects you can apply to the inputs. The default buffer size is a slimline 128 samples. Input and output metering are very clear, as is the waveform display that builds up as tracks are recorded into the main arrange area. This can be zoomed horizontally by the usual iPad gestures; you can go in as far as you like, but the minimum zoom level only fits less than two minutes' recording into the iPad window, so you can't easily see your whole song in one view. Holding your finger for a second on an audio region or blank area brings up a 'hotbox' offering various editing options: regions can be sliced, copied, erased, pasted, faded in and out, and renamed. The main restriction here is that although it's possible to select multiple regions by tapping them sequentially, not all the editing options can be applied to more than one region at once. Perhaps the neatest feature of Multitrack DAW is the clever way in which it can upload and download files over a wireless network. When you want to transfer your iPad recordings to another computer, Multitrack DAW assigns an IP address to the project so that you can access them over a wireless network from any Web browser, as here. Close your song and hit the Wi-Fi button and it assigns an IP address to its project folder. Then, from a web browser on another machine connected to that network, you can surf to that IP address, where you're presented with a neat interface allowing you to download raw files, individual tracks with or without effects, or a bounced mix that is generated on the fly according to your choice of bit depth and format (Ogg Vorbis and m4a are supported as well as WAV). This is very cool indeed, and would be even better if it were possible to download all tracks at once. In practice, Multitrack DAW feels slightly nostalgic; even though you're working with the iPad's touchscreen, the experience is not unlike using an older hardware multitrack recorder, where simplicity rules over features. I doubt that anyone would seriously want to mix their recordings within the iPad if the alternative of taking them to a Mac or PC DAW is available, but in my tests, it showed itself to be a stable and reliable multitrack recording platform. And, at this stage, perhaps that's the most we can hope for. Moreover, a great benefit of the iPad over any conventional computer is that it has no hard drive, and is fanless. So too is the Fireface UCX, meaning that recordings are uncontaminated by any extraneous whirrs, clicks and buzzes. So, would I use an iPad and a Fireface UCX as a serious location recording rig? At the moment, probably not. One major limitation I haven't yet mentioned is that at the time of writing, Multitrack DAW is limited to 16-bit recording, at sample rates up to 48kHz. By the time you read this, however, the developers have promised to incorporate 24-bit recording and to look into the possibility of adding support for higher sample rates, so this is unlikely to be a stumbling block for very long. Among Multitrack DAW's useful features is an effective metronome. Perhaps a thornier issue is that almost every aspect of the Fireface's setup is intended to be configured from software, but there is currently no app that allows you to do that configuration from the iPad itself. In class-compliant mode, front-panel control is pretty much limited to adjusting master volume and the gain of the analogue inputs; you can't even switch phantom power on or off, or reverse input polarity, and although TotalMix setups work, there's no way of adjusting monitor balances, reverb send levels and so on. The most you can do is use the UCX's six memories to store likely configurations and hope for the best. So, although RME's achievement in getting the UCX to work with the iPad is very impressive, it's probably fair to say that if you were actually designing an iPad-specific recording interface from scratch, you might end up with a rather different set of features. 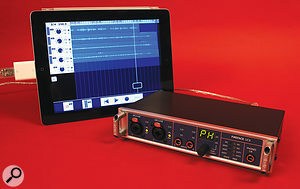 Like most recent RME interfaces, the UCX features no analogue controls at all: everything is configured from software or using the front-panel encoder and attached remote.At the least, though, the combination of the iPad, the Fireface UCX, the Camera Connection Kit and Multitrack DAW functions very well indeed as a proof of concept. It demonstrates that the iPad is capable of recording multitrack audio, that its interface is up to the job of running a multitrack recording application and making it easy to use, and that it's possible to add high-quality audio hardware to it. The iPad support is a superb bonus feature, and yet another way in which RME have made their product stand apart from the crowd, but at present it falls into the category of 'neat add-on': nice to have, but you wouldn't buy the Fireface UCX for that alone. 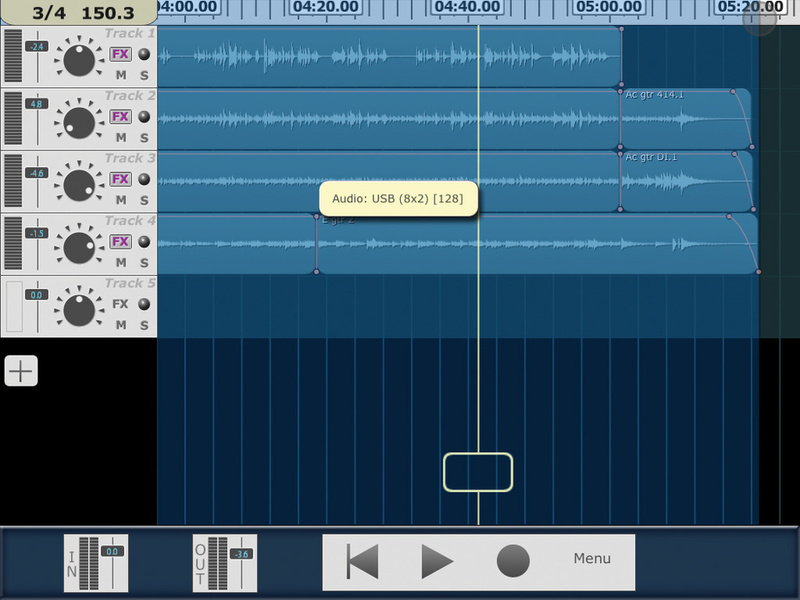 That said, the landscape is changing rapidly, and soon there'll be a wider choice of multitrack recording apps. All it will really take to unlock the massive potential of the platform is the availability of more software, and some way of configuring the Fireface UCX directly from the iPad. If that can be achieved, there's no obvious reason why the system shouldn't be as reliable, practical and professional for small-scale location work as a laptop-based rig. 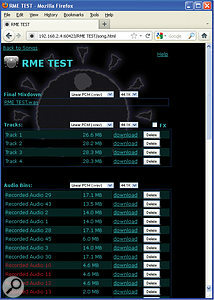 It seems to be RME's design philosophy to always go a bit further than users have any right to expect. TotalMix FX, for instance, is so powerful and comprehensive that it's hard to imagine who might need to use all of its features at once, yet it's reassuring to know that whatever you might ask of it will be possible. And, likewise, few other manufacturers would have invested the development time to make a serious professional interface compatible with a tablet computer that is more associated with Web surfing and Angry Birds. It's a typically forward-looking move, and one that I'm sure will pay dividends when the rest of the world has had time to catch up! For now, the main reasons for buying a Fireface UCX remain its excellent sound and performance in a computer recording context — and if its combination of I/O meets your needs, those reasons are pretty compelling. If you want to record eight simultaneous inputs to an iPad, the only other option I know of is Tascam's US800, which is in every other respect very different from the Fireface UCX! In the Mac and PC world, there are innumerable Firewire-based interfaces, with Metric Halo's Mac-only 2882 being perhaps the closest rival in terms of features. There are rather fewer USB-compatible models, and none with the same complement of I/O and built-in effects, but you could consider MOTU's Ultralite Mk3 or the Steinberg UR824 reviewed in this issue. USB2 & Firewire audio & MIDI interface. Compatible with: Mac OS 10.5 and above, Windows XP SP2, Vista and 7, iOS 5. Analogue inputs: eight (two 'combi' XLR/jacks, two front-panel instrument/line jacks, four line jacks). Analogue outputs: eight (six rear-panel jacks plus front-panel stereo headphone jack). Digital I/O: word clock in and out, stereo coaxial S/PDIF, optical S/PDIF or ADAT. Other I/O: two MIDI Ins and Outs. Like the original Fireface UC, the UCX doesn't have enough back-panel space to accommodate its two MIDI Ins and Outs directly, so these are accessed by a flying cable which hooks up to a single multi-pin connector. Unlike the UC, however, the UCX also boasts a second such connector, and this is used to attach the bundled RME Basic Remote. Sharing many design elements with RME's Babyface interface, this remote is also compatible with the larger Fireface UFX and the ADI8 converter. It has no socketry or LEDs, just a 5m captive cable, and provides a large rotary encoder and two buttons. The encoder controls the level at whatever outputs are designated Master and/or Phones in TotalMix; it also operates as a button, and when pushed, dims the output level by a user-specified amount. The right-hand button is labelled Recall and restores the output volume to a fixed value, which again can be set in TotalMix. The left-hand button, meanwhile, is labelled Prog. I was hoping it would call forth an instant Mellotron solo, or perhaps some custom Roger Dean artwork for TotalMix, but in fact it's, er, a programmable button. Which, in the scheme of things, is probably more useful. Changing the function of the programmable button requires a visit to the Key Commands dialogue in TotalMix, and the list of options is huge. It can, for instance, activate talkback (assuming you have a talkback path setup in TotalMix), sum the main outputs to mono, recall a mixer snapshot, switch speakers or mute the entire mixer. In practice, the remote works flawlessly, and is a lot more fun than reaching over to the unit's front panel to adjust volume. It's a shame that only one of the buttons is assignable, as I'd rather the Recall button could be made to do something else, but for those seeking more control, RME also have in the pipeline an Advanced Remote with six additional programmable buttons (which are already editable in the Key Commands dialogue). Connects via USB or Firewire. Offers a lot of I/O in a small package, and sounds great. TotalMix FX is astonishingly powerful. Class-compliant mode makes it possible to record up to eight analogue inputs on an iPad, and works well. Six internal memory slots allow the UCX to be pre-configured for use away from a computer. Many of the UCX's features can't be accessed or configured in stand-alone or class-compliant modes. 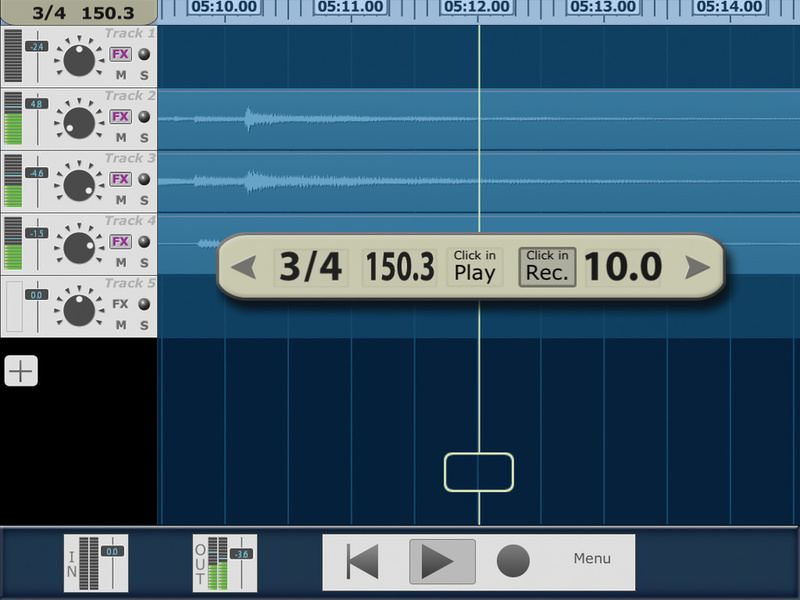 App developers haven't yet fulfilled the potential of the iPad as a platform for serious multitrack recording. Only two mic preamps and one headphone socket. 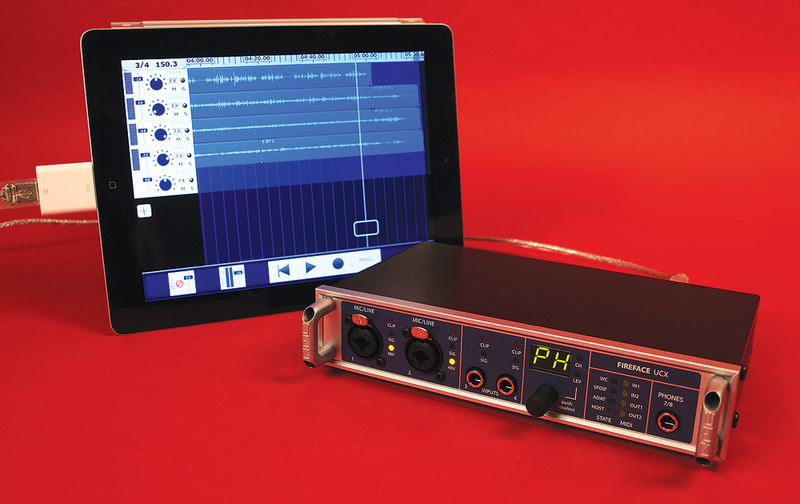 The Fireface UCX is another excellent product from RME, and as well as being a sound choice for Mac and PC-based systems, demonstrates that high-quality multitrack recording on the iPad is a real possibility. Synthax USA +1 330 259 0308. Dell XPS M1710 laptop with 2GHz dual-core CPU and 4GB RAM, running Windows 7. 16GB iPad 2 (Wi-Fi only version) running iOS 5. Tested with Steinberg Cubase 6.05, Harmonic Dog Multitrack DAW, iOSmidi.com MIDI Monitor.